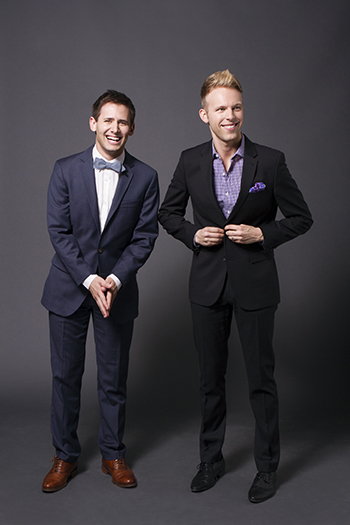 As part of the award-winning songwriting team Pasek and Paul, Benj Pasek’s star has risen high this year. The duo won an Academy Award for Best Original Song for “City of Stars,” from the film La La Land, and six Tony Awards (including Best Musical and Best Original Score) for Broadway’s Dear Evan Hansen, the story of a high school’s reaction to a suicide. Next up, The Greatest Showman, starring Hugh Jackman as P.T. Barnum, opens in movie theaters on December 25. Pasek, 32, is now working on Disney’s live-action film adaptations of the animated classics Aladdin and Snow White. A resident of Manhattan, Pasek grew up in Ardmore, Pa., and met his collaborator, Justin Paul, at the University of Michigan, where he received a Bachelor of Fine Arts in musical theater. His father, Jeff Pasek, is an attorney, and his mother, Kathy Hirsh-Pasek, is a developmental psychologist who loves music. She was his date at the Academy Awards. You thanked your mother in your speech at the Academy Awards for allowing you to “quit the JCC soccer league to be in a musical” and dedicated your award to “to all the kids who sing in the rain and all the moms who let them.” Can you describe your mom’s influence on you? My mom is probably the most creative person I know. She observed my brothers and me growing up and translated our developmental milestones into song moments for children’s musical groups and five albums. I ended up doing the same thing—capturing life moments and making them into music. Why does Dear Evan Hansen resonate so deeply? The musical is about finding your identity, about forgiveness and coming to terms with the lies others tell us—and even more important, the lies we tell ourselves. When you share the journey in the theater with a thousand other people, you find that when you shine a light on the dark place in your life, a lot of other people are huddling there as well. It’s life-affirming. The plot is loosely based on your real-life experience in high school. Can you clarify? A student I didn’t know very well passed away. Everyone made the death about him- or herself, and a lot of people who didn’t know the student, myself included, felt the need to insert themselves into the tragedy. I was curious why I felt that need. In college, Justin and I talked a lot about how our generation responds to tragedy and the dichotomy between public connection [through social media] and private isolation. You are active in Reboot, a nonprofit that seeks to reimagine Jewish tradition and ritual for contemporary Jewish life. How has Judaism helped you to understand “the other”? Being Jewish, you grow up knowing you are part of a unique group separated from the mainstream. That can be incredibly powerful, because it allows you to question behavior and culture, and it separates you from going along with the world as it is. I want to see if Judaism can be a means to work out the questions I have about the world. We don’t draw as many parallels as we could between our own history and what people are experiencing in every corner of the world. Why did you take on The Greatest Showman? The story is about the American dream. It’s about envisioning what the world could be rather than what it is. There are plenty of debates about Barnum’s sense of morality, but no one can doubt that he started with an idea and made it bloom into something that has changed American culture forever. That’s a pretty inspiring story, parallel to the Jewish immigrant journey. My grandfather walked from Russia to Germany, caught a boat to the United States and started from nothing. Two generations later, I’ve been afforded privilege as a result. An inspirational young man! Dear Evan Hanson was amazing! Can’t wait to see what other gifts he has for us!